Security concerns raised by Royal Navy whistleblower William McNeilly have been vindicated yet again, this time by a top military official. Defence Police Federation chairman Eamon Keating has told Defence Secretary Gavin Williamson that budget cuts have left military bases open to attack. 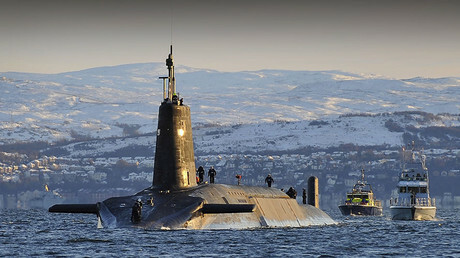 In 2015, McNeilly leaked a report to WikiLeaks detailing safety and security failures aboard the UK’s Trident nuclear armed submarines and at their base at Faslane in Scotland. The same concerns were raised on Wednesday in an open letter to Williamson, only this time by the officers in charge of base security. In his letter, Keating pleaded with the Tory minister to veto further cuts to the defense budget and issued him with stark warning: cuts to the Ministry of Defence (MoD) police force budget will lead to fewer officers on the ground and weakened security at Faslane and other MoD sites. “I must highlight the deeply concerning, and in many cases deplorable decision making that is leaving many of the UK’s critical military assets and sites at unacceptable risk of attack on our own shores,” Keating’s letter reads. Keating’s plea for more finances echo the same concerns raised by McNeilly two years ago. At the time, McNeilly’s claims were dismissed by the military as unsubstantiated folly. “I accessed the Faslane base for over a year. While I was assigned to the Trident submarines, I accessed them multiple times a day, most days of the week. It is ridiculous for anyone to say that I didn’t know anything about access when I accessed them on numerous occasions,” McNeilly told RT. “Now the Defence Police Federation chairman has made a statement that clearly agrees with what I said years prior,” he said. Recounting his personal experiences from his time at Faslane, McNeilly said his ID would rarely be checked properly and that he would seldom be questioned by security staff at the gate. “I accessed the Trident submarines without having my ID checked. I just walked straight past [security], down onto the Trident submarine, and left my unchecked bag just feet away from a nuclear missile. “You don’t need 50 years of experience to see that’s a major security risk. Keating and McNeilly have now both called for more security to protect UK munitions and bases.